Remember this? Well, now we've got these. 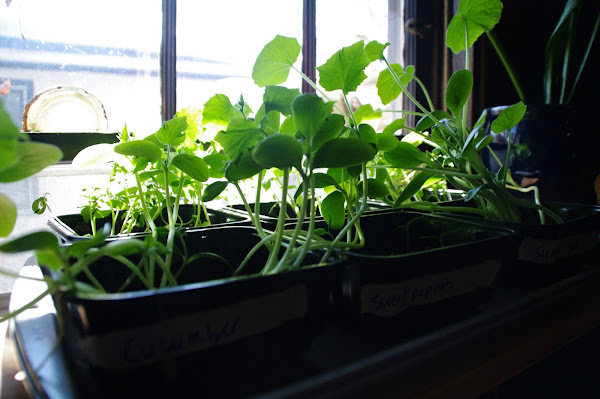 It's too early for such large seedlings, I know, but that just means we might want to plant again. I saw another great TED Talk last night and it gave me so much motivation and drive for the 365 photo project...recording each day, motivation to do something interesting every day, seeing progress. I might not know what I'm doing here, but I definitely know that I want to continue. Yes yes yes. Thank you for the reminder - I am loving your photos, and am inspired to start my own 365 project. I didn't take nearly the photos on the Southern Scampabout as I'd hoped to - sure, it was grey most of the time, but still - and I need to develop a real photography practice, which the project would help with. Thank you, and keep going! P.S. Any tips? Does there have to be a theme?